We had a Father’s Day Cook Out on Sunday. It was a traditional afternoon of hanging out in the yard, visiting and catching up, eating hamburgers and hot dogs, and playing games. Now, if I’m being completely honest, when it comes to most outdoor games I prefer to sit and watch and take photographs. And drink beer. 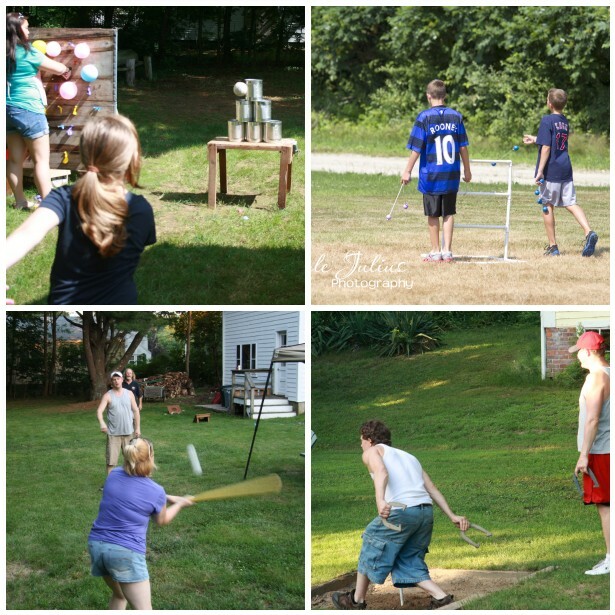 This new active lifestyle that I am embracing, however, dictates that I need to get up and move frequently, though, and that’s why I’ve come up with this week’s Ten on Tuesday topic: 10 Favorite Backyard Games. The Bean Bag Game. Some people call it “corn hole” but not us. My grandfather made our set way back in the 1970s and we still use it all the time. Ladder Croquet. Competition gets fierce around our house when this game is played. Horseshoes. Yes, we have horseshoe pits in our yard. I stink and Dale has to give me a 15 point handicap just to make it fair but I still have lots of fun with it. Whiffle Ball. Simple and fun – until someone gets hit with a ball, anyway. Football. It’s the perfect way to burn up some energy during half time of those fall football games. Bocce. We used to have a set and we played it frequently. Badminton. Of course, this one requires setting up a net if you’re going to play correctly but it’s fun. Frisbee. Another one that’s simple and fun – until someone gets hit with the frisbee, anyway. Giant Jenga. We do not have this but I want it. Did you hear that, Dale? Toss Across. Anyone else remember this? I loved it when I was a kid! You may have noticed that I did not list croquet. Sorry, Kym, but I just don’t love that one. If I ever come to your house on Father’s Day, though, I promise to do my best for my team! How about you all? What are your favorite backyard games? If you wrote a Ten on Tuesday post be sure and click the link below so we can all come read it. And if you want to receive the Ten on Tuesday topic every Monday, just click here to subscribe. I love egg tosses! And frisbee! Since mostly I’m playing in the back yard with the mutts, there’s a lot of two-ball, Maddie’s favorite game. It goes like this: human toss the ball, dog catch the ball. Dog run around with ball until human tosses the second ball. Repeat. Since I haven’t had a backyard in 50 years you won’t see me with a mallet or horseshoe in hand. We do have a disc golf park in the neighborhood, however. Too bad I don’t know how to play. It looks like you have a ton of fun playing in your yard! you gownna poke yer eye out wid dat ting! We’re bocce and badminton fans. But to be truly honest, cribbage is about as wild as we get in our backyard. You celebration looks like a ton of fun! Bocce and croquet since I was small enough to get my fingers pinched between the balls. In fact, we might have to do that soon, although none of us have a great yard for it right now. Just played Ladder Ball for the first time on Memorial Day. So. Much. Fun. Even in the tiniest of backyards that my son calls his. Our backyard, although large and grassy, has lots of uneven spots making badminton an occasion for twisted ankles. We do have a nice croquet set – see above. So we did our family favorite which is to go out and eat a lot….. I only discovered Bocce a few years ago and I enjoy it very much but my favorite is Volleyball. Our backyard is very small and heavily landscaped–lots of plantings and a small garden around the perimeter and a small area of grass in the middle. Bottom line, you have more fun in your back yard!